Working for several years from a home office in an extended and extensively upgraded ex-state house has provided me with a great opportunity to monitor performance and see what works well and what doesn’t; knowledge that can be applied to subsequent design projects. 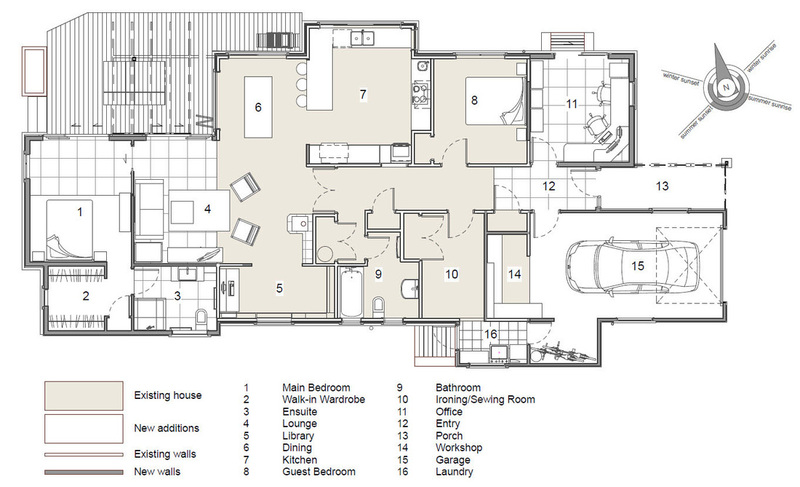 To incorporate passive solar designed additions resulting in a house that was comfortable all year round, with good natural light and low energy and water use. We wanted a spacious outdoor entertaining area and easy connection to backyard herb and vegetable gardens. 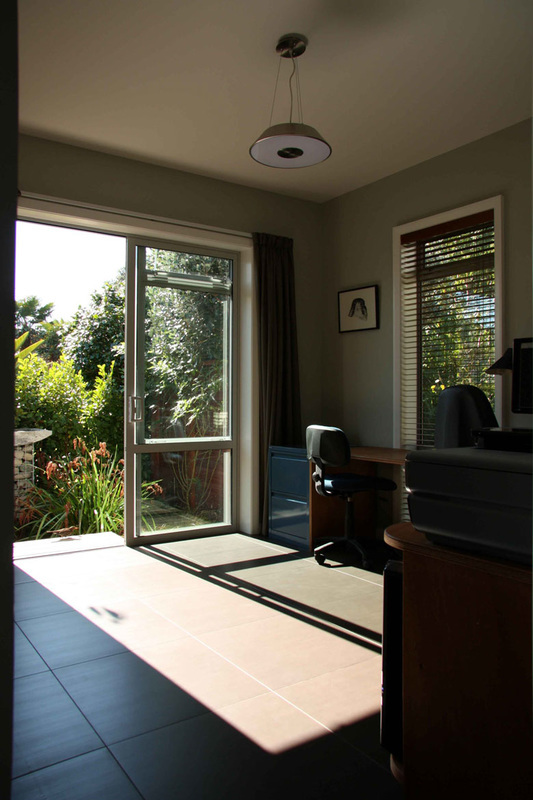 An office near the front of the house for my architectural design practice was also important. Building waste was to be kept to a minimum so as much of the existing room layout as possible was to be preserved. We added to the existing house at both ends. The whole exterior was re-clad and the existing timber joinery was replaced with double glazed aluminium framed units. Energy efficiency and an all-year comfortable indoor environment were primary goals. This was achieved with passive solar design, which allows the sun deep into the house in winter but keeps it out during summer, combined with high levels of insulation. We kept the simple hip roof style to reflect the style of other houses in the area. The interior deliberately displays the hybrid between old and new. Original doors are panelled, whereas the new doors in the rear addition are plain; original floors are polished rimu T&G, whereas new floors are either tiled or carpeted over the concrete slab. The new ceilings also feature square stopping in contrast to the scotia finish of the original portion of the house. There is some blurring of these distinctions where two of the original panelled doors have been re-used in the new entry and the square stopping has extended into the original dining room, but generally no attempt was made to make the old look new or the new look old. All the earth excavated from the foundations was stock-piled and reused on site, some in the planters and the rest in raising the lawn level at the front and rear of the house. No soil was removed from site. The existing roof tiles were sold on TradeMe as was the timber joinery, the hot water cylinder, and the oven. All the bricks from the original veneer have been reused on site: on the driveway, the raised planters, and as a cladding over the foundation walls at the front and rear of the house. Scoria that was either dug up during excavation or already on site as landscaping was used in a low stone wall along the road boundary. Much of the demolition plasterboard was buried on site, some under the raised planters. All concrete that was pulled up from the existing drive and paths was either used as fill under the concrete slabs or buried on site. Approx. 20-24m³ of waste went to landfill, mostly consisting of painted timber which could not be used for firewood. The bulk of this was T&G panelling which came from the old soffits and laundry/porch interior lining. The old kitchen cabinets were re-used in the new workshop at the rear of the garage. Although the rear addition floor was about 700mm above existing ground level and timber would have been cheaper the benefits of passive solar design justified the additional costs. The existing deck was extended and the old treated pine decking was replaced with vitex, a sustainably logged timber from the Solomon Islands. Most of the old decking has been re-used as fencing in several places around the property. Except for the garage and laundry, all the walls are now 140mm thick as opposed to the normal 90-100mm. New walls have 140mm framing and the existing 100mm studs were packed out with 45x45 battens. This has given us great levels of wall insulation throughout. The concrete floor slabs have 50mm polystyrene insulation under the entire area and the timber floor has polyester. 90x45 timber is used to insulate the concrete slab edge. Fibreglass Marteen reinforcing bars are now easily available and these are highly recommended for the connection between the slab and foundation wall to minimise thermal bridging, rather than the steel links that were used here. These are shown on the Energy Efficiency page. 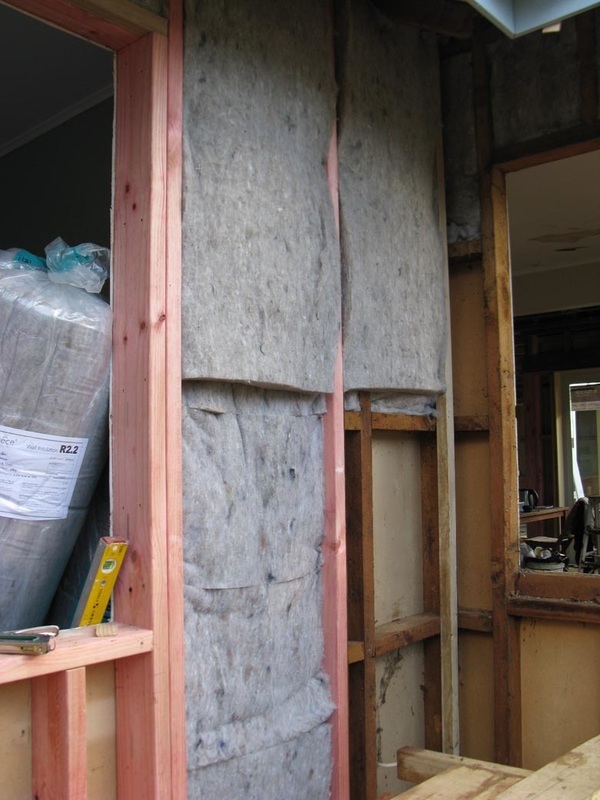 140mm thick external walls allowed us to fit in extra wool/polyester wall insulation with one layer of R2.2 and an additional one of R1.2 alongside. In the ceilings, a double layer of R2.2 wool/polyester ensured a high level of insulation. 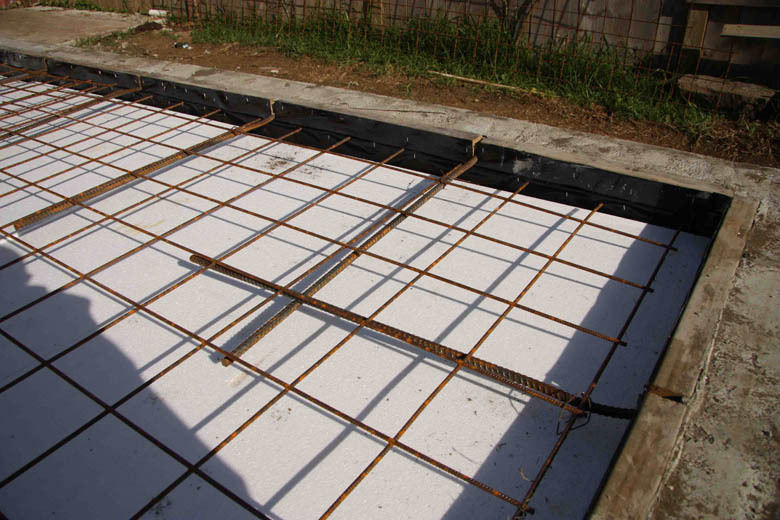 The concrete slab has 50mm polystyrene under it and polyester pads were inserted between the existing floor joists to complete the thermal envelope. Averaged annual electricity use is less than 10kwh per day, with monthly average lows under 8kwh during summer and maximums just over 12 in winter. 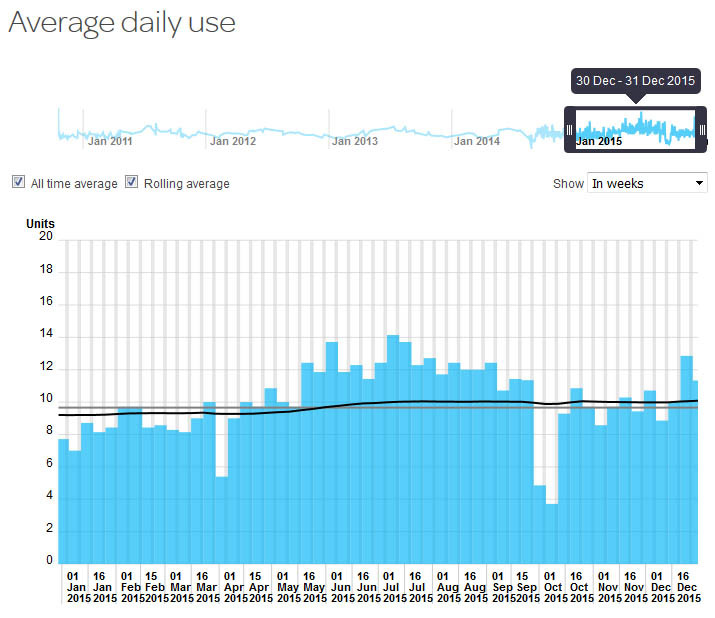 Totals for each year are under 3600kwh. This is for two occupants plus occasional guests and also includes a home office that uses a base of 7.5kwh per week, excluding any heating. Summer indoor temperatures stay below 25° even when outside temperatures reach 29°. Due to the heat absorbed by the tiled concrete floor after sunny days in winter, the living area temperatures stay above 20° throughout the evening, even if temperatures drop to below 10° outside. As a result, no heating is required on such days. The fireplace is used after cloudy days but usually only to bring the temperature up from 17° or 18°. We installed the smallest model Metro woodburner fireplace and this has been more than adequate for the lounge/dining/kitchen area and, if well fuelled up, doors to other parts of the house need to be opened. At the time we built, the price premium on double glazed aluminium framing that was thermally broken was too high for our budget but, as these are now much closer in price to standard double glazing, using anything less is not recommended. These units have low thermal conductance connectors between the inner and outer aluminium extrusions and significantly reduce heat loss through the frame. Although not in an ideal position, the original pergola post was preserved as it had an established grape vine on it, which is ideal for summer shading of the outdoor area and provides delicious grapes each summer. 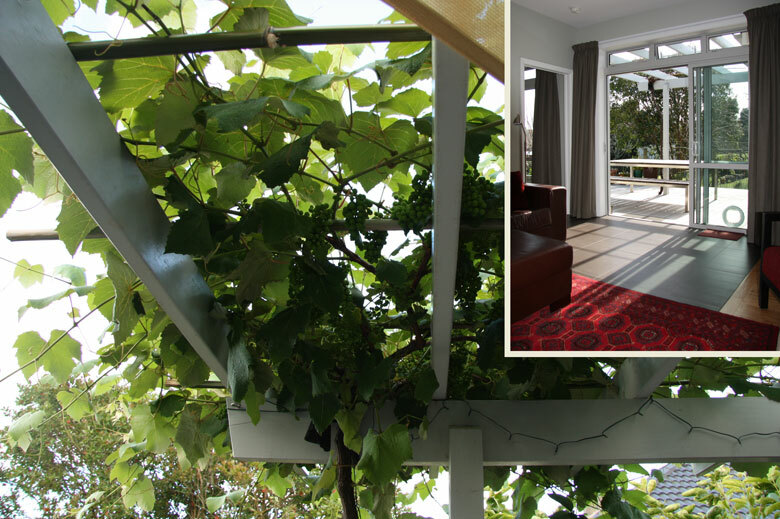 The vines require cutting back each autumn, allowing maximum sunlight into the house during winter (see inset below). 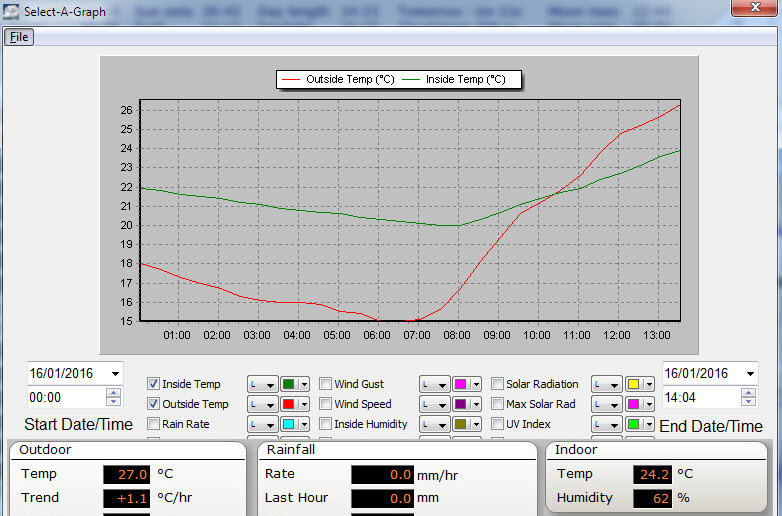 With the focus firmly on warming houses up in winter, summer overheating is, to a large extent, overlooked. Just as passive solar design can be used to let the sun in during winter, it can also keep it out during summer. In conjunction with high levels of insulation and correct eaves sizing on the northern side, another contributing factor to keeping a house cool is the minimisation of west facing windows, to prevent overheating by late afternoon sun. Robust passive solar design means that even in mid-summer when the house is closed up (with only some high-level fanlight windows open), indoor temperatures can be 3-5° cooler than temperatures in the shade outside. The thermal mass which helps store warmth during winter also moderates temperature highs and lows during summer, as can be seen in the graph below. There are other reasons not to have dark coloured steel roofs. They expand and contract more, leading to potential noise during warming and cooling and also adding stress to fixing seals and flashings.